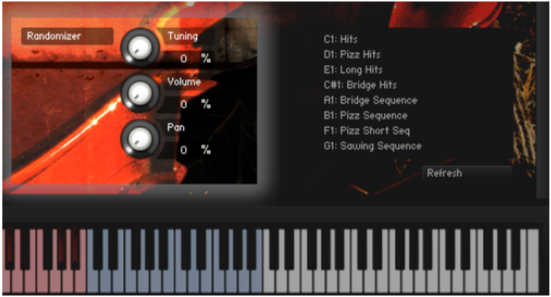 Tormented Strings is an experimental sound design library for Kontakt, created from recordings of prepared violin using nonstandard playing techniques (and objects). The violin was prepared with paperclips, glass bottles and rubber bands, and was played with bow, fingers, guitar slides, razor blades and a metal pick that would pluck above and below the bridge simultaneously. The results are unusual, aggressive and haunting sounds that you won’t find in any normal string library. This instrument are intended for use in soundscaping, sound effects, hits and stings, as well as adding some unnerving layers to your more traditional compositions. It features a randomization engine that will send the tone swirling into horror. Tormented Strings contains 6 .nki instruments, with nearly a gig of Kontakt-compressed samples in 24bit / 48Khz. Tormented Strings is delivered as a set of 6 .nki instrument patches, delivered as a single .rar file. It is designed to be used in sets of three sonic layers, and requires the full version of Kontakt. It features a randomizing engine to detune, vary volume and spatially pan while playing. Articulations are controlled through keyswitches. Hits – Single notes and very short phrases played with bows and metals. Bridge Hits – Single notes and phrases played with bows and metals across the bridge. Pizz Hits – Pizzicato hits with fingers, picks and metals. Long Hits – Single notes and short phrases that sustain for a longer period. Pizz Short Seq - Short pizzicato phrases played with fingers, picks and metals. Sawing Sequence – Longer phrases with crescendoing, sawing action. Stac Sequence – Staccato phrases played with bows and metals. Bridge Sequence – Phrases played with bows and metals across the bridge. Slide Sequence – Phrases played with a glass guitar slide. Pizz Sequence – Pizzicato phrases played with fingers, picks and metals. The randomizer will change the volume, tuning and pan of each note played. Tuning - Randomizes tuning with a maximum of + / - 5 semitones. Ambience – Processed, stretched and mellowed out to a low, thrumming and menacing hum that's wide and full of space. Motion – Pitch shifted, delayed and reflected, the motion layer adds a sinister, creeping and jittery energy. Detail – This layer aims to catch the direct and detailed noise without overwhelming the other layers.